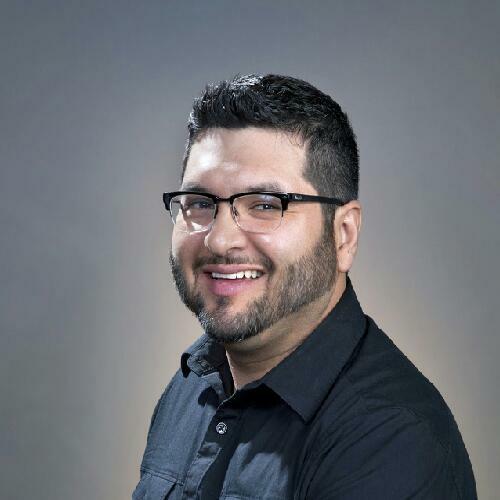 Today’s profile highlights Guillermo Bazua with Lori Carroll & Associates in Tucson, Arizona. Guillermo: I first started with design as a graphic artist, but before then, I was fascinated with comics and the very unique graphic illustration style. This love propelled me to Illustration and advertising art. Graphic arts prepared me for the fundamentals of design. I fell in love with buildings and homes more particularly, on a trip to Wausau, Wisconsin, about 14 or 15 years ago. I can still see the huge leaves falling as I watched a family playing between the trees in front of their home. Guillermo: I enjoy most of the projects I’m involved in, but a recent kitchen and laundry room remodel comes to mind. We are using the same footprint of the existing kitchen, but adding a big twist. We have concealed the pantry opening with a wall of cabinets and integrated refrigeration, along with adding a hidden door opening. Doing so allowed the existing pantry space to double without moving any structural walls. Guillermo: I’m getting close to being over stainless steel appliances. New stainless steel finishes make finger prints not as noticeable, but they are still there. Keeping them looking “showroom” is impossible in a home with kids and active cooking. Guillermo: Different appliance finishes. GE has a very good looking color with their slate. Guillermo: My perceptions didn’t meet the reality, I have always thought highly of GE products. But being in the high end market and specifying the big three, I never considered GE to be on the same playing field. I was grossly mistaken. Monogram has more than a few products that should go in many high end kitchens, the Advantium oven being the first. 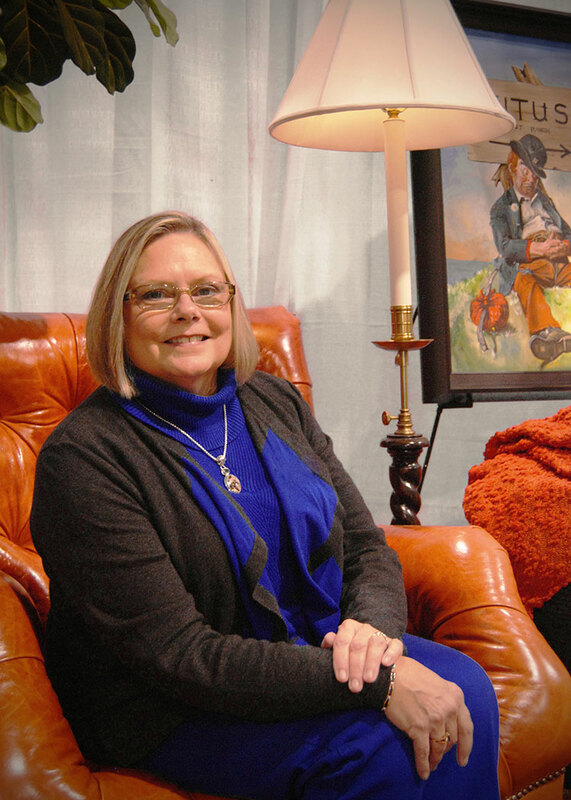 Today’s profile highlights Sharon Titus with Titus by Design in Clackamas, Oregon. Sharon: I have been in the Interior Design business since 1973. While I was going to school for Architecture, I also worked in a bank. One of the staff members was neighbors with an Oriental rug company called Atiyeh Brothers. She said they were looking for an sales person but that they needed to have drafting skills. I applied and got the job. Soon I was working with the outside designers and also worked with a Furniture store that had our rugs in them. I was hooked on design so changed my direction from Architecture to Interior design. Sharon: This last year I had a great opportunity to work on a remodel of a 1950’s home in Dallas, Oregon. The home had several remodels and five peaks to the roof. The client wanted a great room and larger kitchen so my Architect and cabinet person worked with me to create a wonderful new kitchen, family room and outdoor living space. When completed, they had one large peak and a 20 ft. ceiling that extended out to the exterior. The client was really fun to work with and open to all my ideas. You can see the finished project on my web site. Sharon: I have done many traditional homes, and with that, many Tuscany-style homes. I still get requests for it and will always have it in my line up of design but feel I did so many I am a little tired of it now. Sharon: I love the new clean lines and open concept. Many of my remodels work with tile and wood floors as in the past it was mostly carpet. Sharon: So much! I had not worked with the new Advantium ovens and love them. After cooking with one I will not do a kitchen for myself or client without one in it. I also love what you have done with the racks in the ovens. The coating on the racks make them so easy to clean and the slide out is wonderful with the easy glides. Quality is great. Monogram is proud of their quality and they should be. When we did our comparison tests, Monogram won hands down. I had a wonderful time in Louisville at the Monogram Experience Center. We were treated like royalty! Thank you so much for all the information and wonderful food. Your staff is great and made us feel like we were at home. French door refrigerators are the rage today. 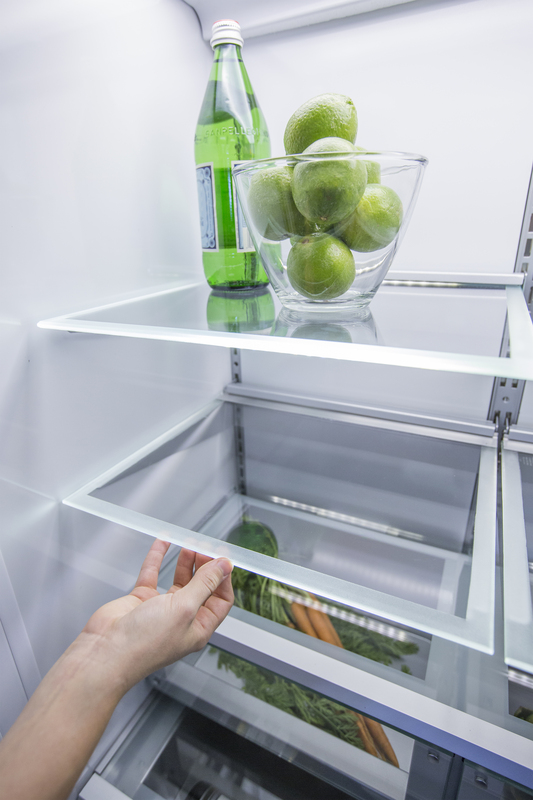 Everyone loves the experience of opening those double-doors and seeing a wide, unobstructed view of the contents of their fridge. Those panoramic views of your boxed wine and party trays are often enhanced by a collection of LED spot lights mounted in tiny “pucks” built into the side walls of the refrigerator case. So dramatic is the presentation, that we’ve actually witnessed homeowners hum a heavenly choral tune while opening their fridge doors. 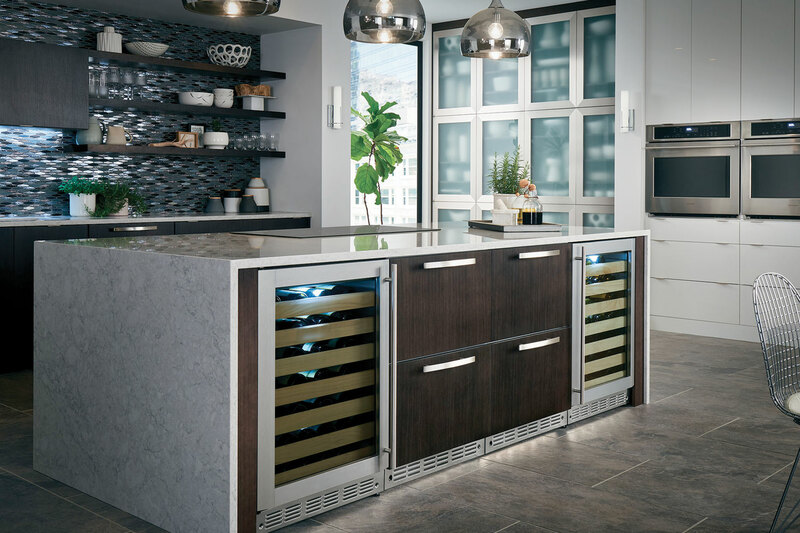 We decided to take this experience to the next level with our new Monogram French Door Bottom Freezer Refrigerator by embedding a row of LED’s directly into each of the four adjustable glass shelves. 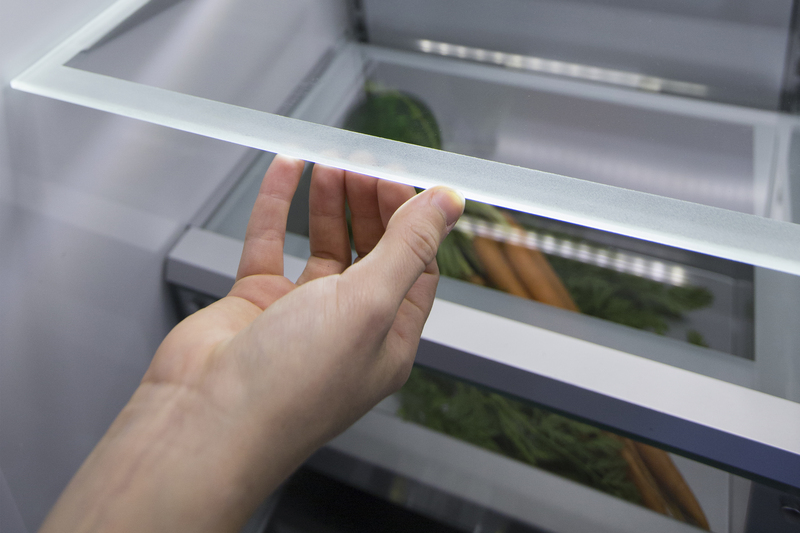 This not only creates the visual drama worthy of a Paul Mottram movie soundtrack, it more effectively distributes lighting throughout the entire refrigerator space. Wait a minute: there are LED lights embedded in adjustable glass shelves? So how do they plug in and yet remain adjustable up and down in the refrigerator? Two of our industrial designers, Sally and Justin, got together in the Design Studio and figured it out. They created an electrical circuit that employs the metal bracket that holds the shelves as a low voltage “bus” and couple it with a tiny prong at the end of each of the 4 adjustable shelves. Is your refrigerator illuminating your food in its best possible light? Are such gastronomical theatrics worth it? We’d like to know. Today’s profile highlights Curtis Popp with Popp Littrell Architecture + Interiors in Sacramento, California. Curtis: My father was a fine artist and an animator, and I was always interested in what he was working on as a kid. I knew I wanted to do something creative, but it wasn’t until later that I became passionate about design. In high school I became interested in transportation design and industrial design, but I knew that a career in car design would be limiting geographically, so I started looking at Architecture, Interiors and furniture design. Curtis: We have had so many, each project is so important to us. One project is a home we are working on for a couple of old friends that is currently under construction. It’s been nice working with friends and it is not a typical project for us. In Sacramento, our firm is primarily known for more modern work, but this is a large whole house remodel/addition to a grand Monterrey-style home in an older established neighborhood. We have mixed old and new, but kept the integrity of the Architecture. Curtis: Reclaimed wood, not because I think it’s a bad idea, more because every restaurant, retail, and coffee shop looks nearly identical. Designers need to get more creative in its application. Curtis: Designers designing everything in a space. We try to incorporate as much site-specific furniture and lighting as possible. Also collaborating with other local artists and designers on projects. Curtis: I learned a lot. From a cooking stand point, I learned how to make a soft boiled egg, the key is vinegar! I also learned about proper temperature of a pan before you begin cooking. As far as the appliances, I am very excited about several GE appliances, specifically the new 30″ convertible fridge and the speed oven. These are two ground-breaking products I can see myself specifying in the near future. Curtis also founded CPopp Workshop, a small furniture design and manufacturing company on a mission to produce thoughtful modern pieces. 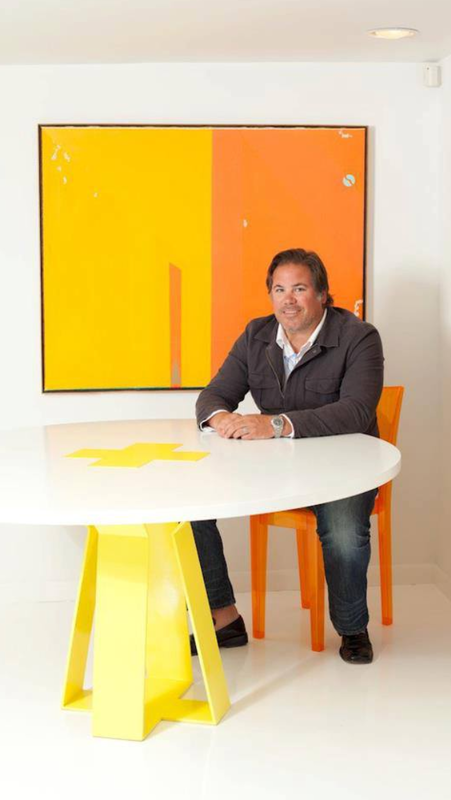 He has been producing custom, one-of-a-kind pieces for homes, boutiques and other businesses across California for nearly a decade. We interviewed each designer to learn a little more about their background and design experiences so far. Today’s profile highlights Alicia Lowe. 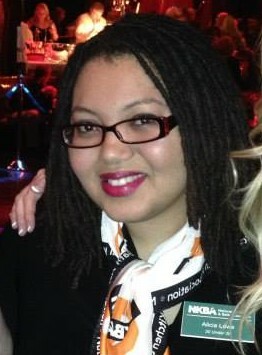 Alicia Lowe, one of the NKBA 30 under 30 designers. Alicia: I have been interested in design since I was in seventh grade, and took an Interior Design elective in my freshman year of high school. I narrowed in on the Kitchen and Bath industry while working part-time in a Cold Spring Granite showroom and met an independent Kitchen and Bath designer. Alicia: I recently worked on a kitchen that was in a century old home that had the original exposed brick. They are still installing and I look forward to the pictures. Alicia: All white kitchens!!! I am a sucker for some color. I once designed a black and red kitchen but never got to see it through. That would have been amazing to see! Alicia: I am loving this grey trend. The color grey is so versatile where you can use it as a neutral, or bring some drama to a space. Similar to the Slate finish in the GE appliance line. Alicia: That EVERY kitchen needs an Advantium! I need to go out and grab the above the range version ASAP. You can make almost ANYTHING in that thing! I recently corrected a client as they were trying to install a 240V model below the countertop, which I had learned is a no-no down while I was in Louisville. You can learn more about Alicia and her design passions here or find her on Facebook. While few of us really know our way around a professional kitchen, a lot of people like to be surrounded by that pro-kitchen look at home. The “pro” signature design details are obvious. Handles the size of a stove pipe (slight exaggeration here), barrel-size burner knobs, and crisp, folded and welded corners, all rendered in industrial strength stainless steel. It’s clearly aspirational for a lot of us wannabe chef’s and we kind of like the visual presence it creates in any kitchen. So we’ve decided to take this aesthetic one step further and created this unique French door built-in wall oven. Introduced last June in our GE Monogram product line, it would be a natural if you saw it in the kitchen of your corner pastry shop. We did, however decide to domesticate this design a bit in order to make it more consumer-friendly. After all, while we aspire to pro-status, not everyone is willing to give up certain conveniences. With that in mind, we did two things not typically found in true pro-products. We linked the doors together so they both open and close simultaneously, and we put a handle on each door – for either right hand or left hand operation. Good usability begins with great engineering. And speaking of great engineering, despite the big challenge of sealing two doors, we didn’t sacrifice the popular self-cleaning feature. 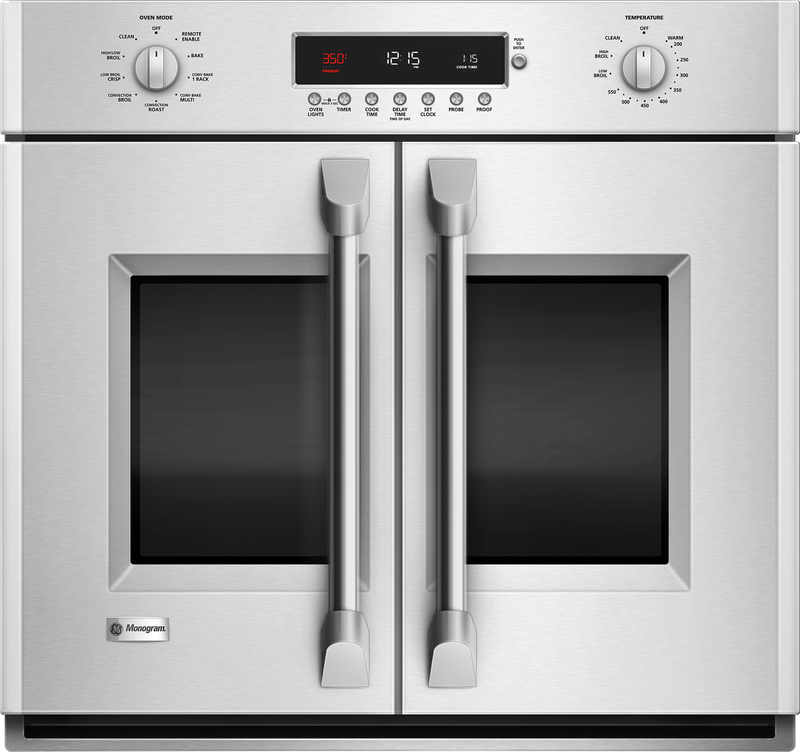 The result is the best of both worlds – a professional looking wall oven with the features and conveniences our customers expect in a high-end product. Are you ready to go pro? Or is this a look best left at the bake shop?